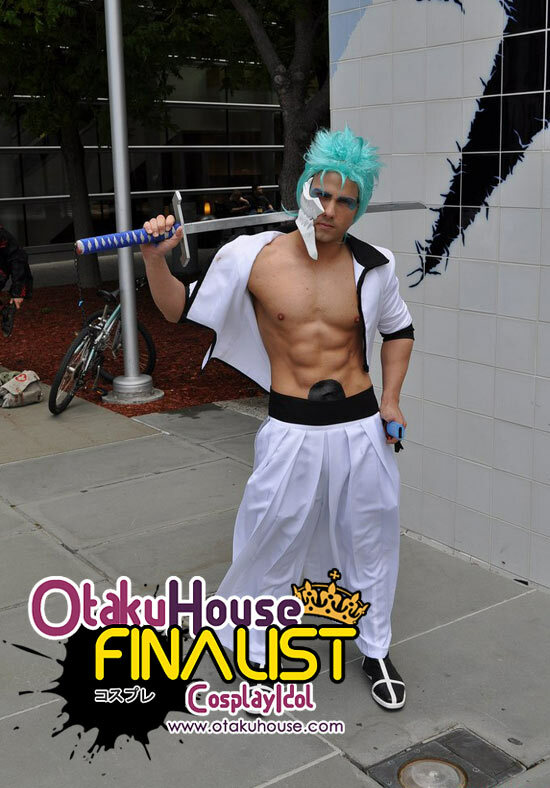 North American Finalist Living Ichigo is an inspiration to many male cosplayers, and the fantasy of many females. Here’s more of his works! This costume consists of 10 parts which include: FULL BODY paint including various markings and sybols taking over 3 hours of preparation and applicating to the body, the sword is made of wood/glue/paint, the nails/claws are plastic sanded into shape, painted black, and applied to all nails with nail glue. The “fur” consists of 5 separate pieces of red faux fur- two pieces for the wrists and ankles and one piece around the shoulders. The wig is custom styled, and the damaged hakama and the damaged haori were both hand sewn using mostly duck-cloth and cotton. The “Vasto Lorde” mask/helm was an extremely complicated process taking months of shaping/hand-crafting using fiberglass, PVC, and paint. 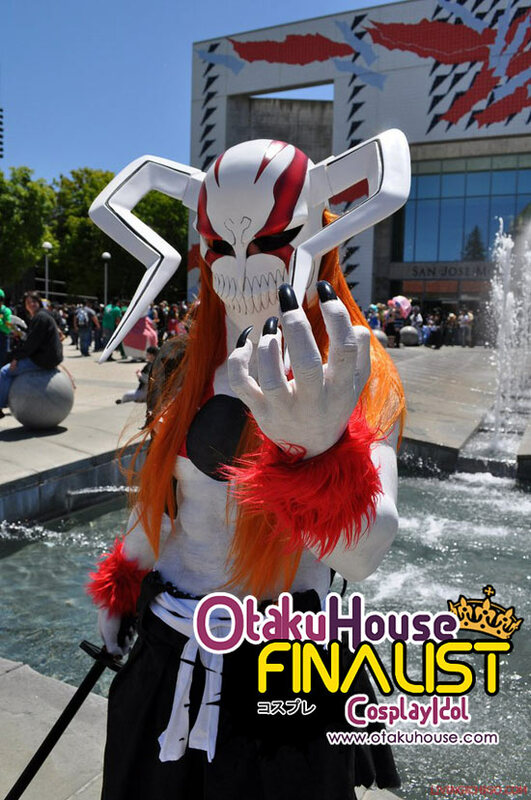 This costume represents an exact replica of Ichigo’s Vasto Lorde form in Bleach, also known as “Full Hollow Form”. This costume consists of 6 parts, which are the straw sandals, the damaged hakama, damaged haori, a wooden sword, Ichigo’s wig, and Ichigo’s Vizard mask. This costume was hand sewn using mostly black duck-cloth and white cotton fabrics. The mask was made out of fiberglass, the sandals are straw, and the sword is made of wood, glue and paint. Also, the wig is custom styled. This costume is worn by Ichigo Kurosaki when he transforms into his Vizard form, and what he looks like as he is damaged in battle. This costume consists of 7 parts, which are: Grimmjow’s jacket, hakama, sword, leather boots, wig, jaw-bone mask, and body paint. This costume was hand sewn using white and black fabric. The boots are custom leather, bodypaint consists of Grimmjow’s “6” symbol (which is only on the back) and his “hollow hole” in the front, wig was custom styled, and the jaw-bone mask was made out of fiberglass. Also, the sword was made from wood, glue, and paint. This costume is worn by Grimmjow, and represents the “Espada-type” uniform, as they are the top arrancars (villains) of Bleach. 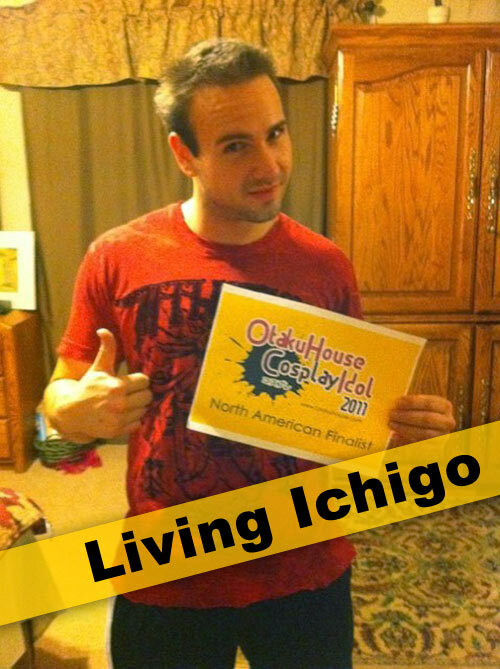 Support Living Ichigo if you think his cosplays are awesome by clicking ‘like’ or ‘Google +1’ at the top of the page!